Please note that the Internet Databases just contain the direkt ancestors and their siblings for the youngest offspring of our ancestral line. Descendants trees generated with the Internet database will therefore not contain all known descendants and thus be incomplete. In total, my family research is much more extensive. For an overview of the names and locations covered, visit the remarks for genealogists on my website. For reasons of data protection, information on living persons as well as detailed information and sources are not published. On request, I can help seriously interested family researchers with individual information and sources from my research results. If you use my data in your own research, it is recommended to reference this Internet databases as source. If applicable, other license rights remain unaffected. This applies in particular to photos from church books and the use of our family crest (please refer to the Imprint)! For further information, e.g. 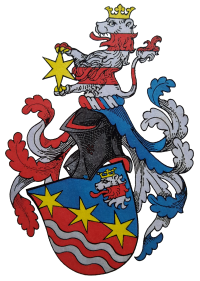 about our family history, family crest and surname or links, I recommend to have a look at the main page familie-stern.de.